In July 1894 Lyons bought two acres of land, occupied by a former piano showroom with its manufacturing buildings, known as Cadby Hall. Both the original showroom and former manufacturing buildings remained in use, albeit greatly altered, until the 1980s when the whole site was demolished and redeveloped. During this period tens of thousands of people had toiled in the manufacture of all manner of foodstuffs and in the support operations which supported the production. 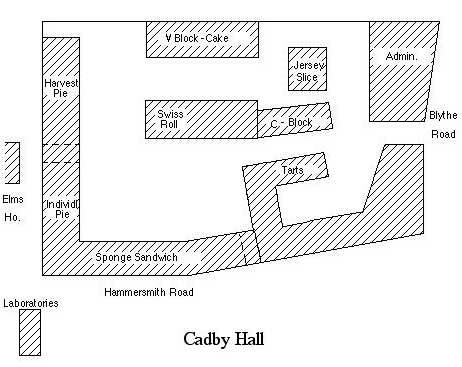 Cadby Hall's history can be traced to 1873 when the piano manufacturer, Charles Cadby, bought 8.5 acres of the land along High Road (later Hammersmith Road), known as the Croften Estate, where two houses had been demolished to make way for his new factory. He was the sixth child of a family of eleven born to Robert and Ann Cadby in Devizes on 11 July 1811. Charles is known to have moved to London sometime before 1836 where he married Eliza Stewart in Holy Trinity Church, Marylebone, in 1836. It is thought, although not proved, that Eliza was related to Captain William Stewart who discovered Stewart Island off the southern tip of New Zealand in 1809. In July 1841 Eliza died leaving Charles Cadby with a young daughter (two others had died previously). In 1843 he married Valentia Cooke and this union was to have five daughters, of which two did not reach adulthood, and five sons. Charles Henry was the first born son. Valentia died in 1864 and Charles married for the third time, in 1870, to Harriet Mary Lewis. Charles Cadby was apprenticed to a cabinet maker at the age of 14 and probably learned his skills in working at first for another piano maker. He started his own business in about 1839 which was first listed as The Charles Cadby Patent Pianoforte Manufactory from an address at 21 Alfred Street, Bedford Square, London. In 1848 he moved to larger premises in Liquorpond Street but by 1873 had to vacate his factory and warehouse by the Metropolitan Board of Works for street improvements; it became Clerkenwell Road. 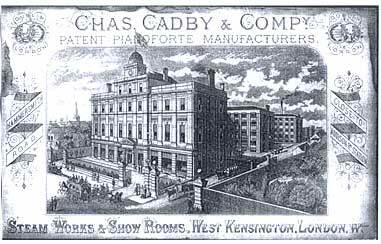 So in 1874, presumably with his compensation, Charles Cadby set about building another piano manufacturing business in Hammersmith, west London. With a frontage of over 100 feet towards the Hammersmith Road he allocated 1.5 acres for his new piano factory and showrooms, the remainder being set aside for smaller building plots. Four distinct blocks were built along with showrooms, which were approached by a carriage drive to the entrance porch. Built to the design of Lewis Henry Isaacs, Cadby Hall was faced in red Fareham bricks and Portland stone with terracotta panels over the first floor windows, the keystones of which contained nine carved portraits of celebrated composers. The royal arms decorated the tympanum of the porch with bas-reliefs on the sides of the entrance doorway depicting music and poetry. Above the three floors of showrooms were rooms occupied by the housekeeper. Administration and private offices for use by members of the firm were situated at the rear of the building. He called this Cadby & Company Pianoforte Manufactory. Set back forty feet from the rear of Cadby Hall itself was a five-level factory in which the finer portions of the pianos were crafted and assembled. Behind the factory block was a five-level mill where most of the sawing, planing and heavier tasks associated with piano making were executed. Towards the rear of the property were additional timber stores, a packing-case shop, stables and a coach-house. The arrangement of buildings had been designed principally with the object of preventing the spread of fire by confining it to one building should such an accident occur. Charles Cadby died on 22 October 1884 leaving the bulk of his estate to his third wife, Harriet Mary, and eight children (one by his first marriage). The factory and its stock including 170 pianofortes were sold on Charles Cadby's instructions. Charles Henry Cadby, the oldest male heir, inherited a share of the business after its sale and, because he suffered poor health, he moved to the warmer climate of South Africa on the advice of his doctor. In 1931 Muriel Cadby, Charles Cadby's granddaughter, visited Cadby Hall on her first trip to England to see the former family piano premises; now used for cake manufacture! Between 1886 and 1890 the Cadby Hall estate was occupied by a variety of businesses, and the local rating record shows that by 1890 the building had been taken over by the Kensington Co-operative Stores, who carried out further reconstruction and revived the name of Cadby Hall (which had been dropped during the intervening period). Apparently Kensington Co-operative Stores subdivided the property before subletting parts of it to the Schweppes Mineral Water Works until the end of 1893. Because Schweppes controlled the frontage to Hammersmith Road, access to the old Cadby property was via a narrow roadway at the rear leading into Blythe Road. By 1899, however, Lyons were occupying No. 62 Hammersmith Road and, in agreement with the Kensington Co-operative Stores, built a new entrance on to Hammersmith Road which provided easier access to and from the factories behind. On taking over the premises the directors decided to retain the original name of Cadby Hall, pretentious though this may have sounded for a factory complex. Nevertheless the name became widely known, especially by people in west London. In time it became one of the largest food factories in the country, eventually covering more than thirteen acres. The firm's head office address was officially 66 Hammersmith Road. The nomenclature adopted to identify the factory buildings subsequently occupied and built by Lyons seems idiosyncratic and remains puzzling. Equally bewildering is the sequence of land acquisitions as the business expanded. It started from a central point, the original Cadby Hall, spreading in all directions but mainly along the Hammersmith Road in an east-ìwest direction. Because Lyons occupied the site for some eighty years, old buildings were modified or demolished and new ones erected to accommodate new food-processing mechanisation and to meet increasing consumer demand. Regrettably, no known complete plan or delineation of the factory buildings from 1894 has survived. From available data it appears that the first block brought into use was the original piano-manufacturing block known to Lyons as A Block. It housed the early bakeries when production moved from Olympia as well as a basement kitchen and a top-floor tea-packing department. The old mill block, 40 feet to the north-west and identified as C Block, accommodated a variety of departments. Initially providing storage for the Hire Department, it came to be used for boiling hams and then for clerical staff from the Checking Department in 1896 before they moved to Addison Mansions and eventually Spike House (once the home of Edward Latymer, founder of Latymer School). In 1899 Blocks E and F replaced what is believed to have been B Block, originally used as stables between 1894 and 1899. Cadby Hall itself, the old piano showrooms, became known as J Block and remained largely intact until the factory's demolition in 1983. A teashop opened in 1903 providing an important frontage onto Hammersmith Road at this time. Buildings on the western side of Cadby Hall numbered N, O, P and Q were built in 1910-12 together with the roadway that connected with the old yard in 1914. In 1928 a large factory and dispatch (a central reporting point for loaded vehicles entering or leaving the factory area with goods) with offices above was erected on the northern side of the estate, replacing four earlier blocks known as H, T, L and M. Built to a high standard for factory use and having a large ground-floor dispatch, the new block, numbered WX, became offices for a number of departments as well as the administrative headquarters of the company. This building was the only one identified by two letters, W for the factory part and X for the clerical. In 1928 the original street-level administrative offices, situated in the eastern part of the old Schweppes Mineral Water Works, were demolished to make way for a larger yard and garaging. Buildings belonging to St Mary's Roman Catholic Training College became part of Cadby Hall in 1925, and one of the two-floor stable blocks nearby was knocked down to make a second road connecting with the main factory estate. Blocks T, U, V, F(1) and T(1) were constructed at this time. R block, which housed the ice-cream department, was built in 1913 and R(1) in 1936/7. Within twenty-five years of taking over the piano factory and its showrooms, Lyons had progressively acquired properties in the immediate vicinity whenever they came on the market, including shops, private houses and apartments, laundries and in one case a seminary. This allowed for the rapid expansion of the factories as the business grew; and the complete block of land along the Hammersmith Road between Blythe Road and Brook Green (and beyond) soon became one vast heterogeneous manufacturing enclosure where over 30,000 workers toiled twenty-four hours a day 365 days a year. Some parts of the organisation never closed. No. 219 dispatch (a small clerical office, so called because of its telephone extension number, providing a focal point for urgent and private orders, mainly family) and the telephone exchange, for example, were always manned so that any call from any part of the world could always be taken. After 1894, the factories at Cadby Hall had been progressively enlarged to satisfy the phenomenal expansion of business in all departments. However, by the end of the First World War there was little scope to extend facilities at Cadby Hall sufficiently to cope with demand, and management's plans for a massive increase in production were threatened. Accordingly a decision was taken to purchase a large piece of land at Greenford in Middlesex, where a new tea, coffee and confectionery factory was built to alleviate the pressures on Cadby Hall. 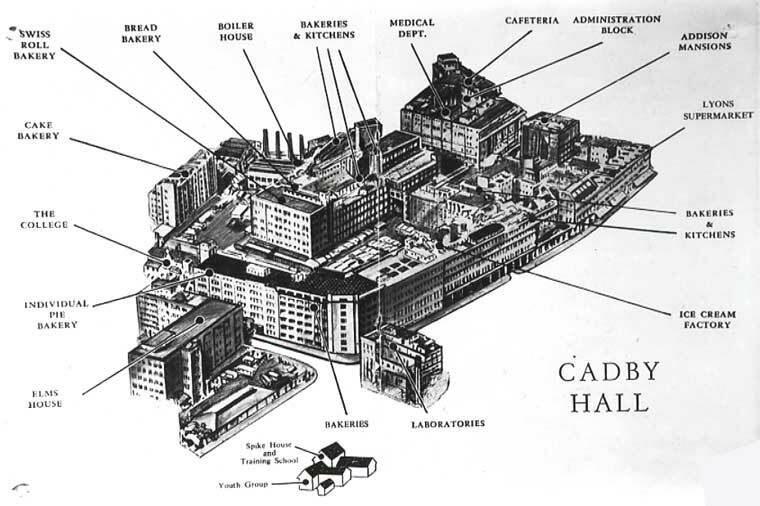 Nevertheless Cadby Hall remained an important food producing factory and became a household name throughout the first half of the twentieth century, and beyond, when it appeared on all the food labels of the Company as well as the thousands of letters and envelopes which left head office. The name was so synonymous with J. Lyons & Co. that three further Cadby Hall's were named across the World for the Company's overseas operations. There was one in Toronto, Canada, another in Natal, South Africa, and a third in Salisbury, Rhodesia (now Harari, Zimbabwe). Cadby Hall in London has also earned a place in history as being the birthplace of the World's first business computer developed here between 1949-1951 specifically for clerical tasks. Cadby Hall in 1887 during a Jubilee Procession Rehearsal. 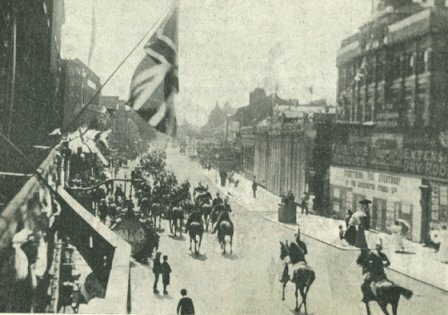 The actual procession took place on Saturday 8 June 1887.